If you missed out on the CEO 2013 grand finals of Super Street Fighter IV: Arcade Edition 2012, then you're in luck. Should you happen to want an encore, you're also sliding down a rainbow with a leprechaun because the replay is inside. 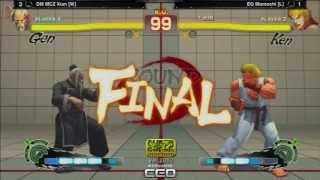 CapcomFightersTV has uploaded the Super Street Fighter IV: Arcade Edition 2012 grand finals from CEO 2013. DM MCZ Xian used Gen to battle EG Momochi and his solid Ken play. For the full CEO 2013 results, click here.